A musical for young audiences brought to the stage by the Picrokole Company. 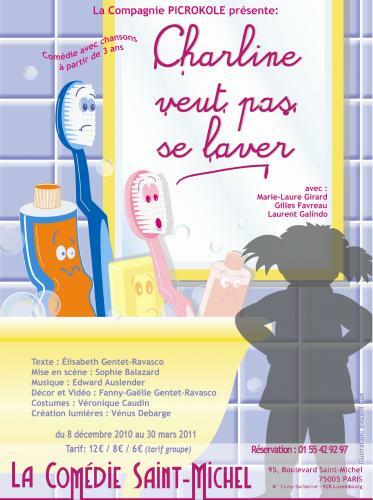 Starring Marie-Laure Girard, Laurent Galindo and Gilles Favreau. With a great deal of imagination and humour, the Picrokole Company presents a funny, touching musical comedy for children from 3 to 8 years old. This new original show deals with hygiene and grooming, where much to the delight of all, young and old, everything always ends well and with a song. Little Charline never wants to wash! Her toys, worried and afraid of the germs, decide to come to life and show her how important it is to be clean and that washing yourself can be lots of fun. About the music: I wanted to give little Charline and her toy friends music that was colorful, mischievous and sincere. I paid particularly close attention to the transitions between the spoken words and the songs, to make them as smooth as possible with no real break. Kids love it. Parents approve of it and have fun too… Enhanced by funny songs and bouncy choreography, this is a show that both young and adult audiences will watch with with a smile on their face. Finally a show that is funny, colorful and inventive and that, without being sentimental, casually delivers sound advice. The actors/singers are all fantastic. The cast knows how to grab the attention of the children as well as how to charm the adults, all with irresistible humor and imagination. The show harmoniously blends puppets, games, songs and video; a pleasure for young and old alike. Don’t miss it! A children’s story that transforms daily grooming into fun and games. The songs are easy to remember and the simple choreography lets the children relive Charline’s adventures at home. You’ll love “Charline Won't Wash” … A musical with puppets, theater and dance, that gets the audience to participate. It is joyful, colorful and educational. “… a fresh, simple show where theatre, dance, songs and puppets are combined by three delightful actors who play with their audience and get their educational message across with humor. A show that is both educational and entertaining! I went to this show with my 4 year old granddaughter, who really enjoyed it. Germs hold no secrets for her now. It is well thought out and the melodies are rhythmic and catchy… and children will understand the need for cleanliness. This is a must! Have fun! Don’t miss it! A super show. The direction, the actors, the sets, and songs are all really top quality. My 3 year old daughter loved it, and I had a great time... getting to know soap! A-DOR-ABLE! Charline immediately captivates the little ones, and the not so little ones. I was carried away by the music of Edward Auslender … I encourage Kindergarten and First Grade teachers to bring their students to see this delightful hygiene lesson that is so full of humor and imagination.